If you're been following our articles correctly, here's what our setup currently looks like. R0 [192.168.34.1] - We've named our network router R0. The DHCP server on this router has been disabled and an static IP has been assigned. CARBON [192.168.34.251] - Our physical server running Windows Server 2012 R2 Datacenter. This server is our Hyper-V host. In my example setup I've used a WD Sentinel DS6100 as my physical server. This computer is currently not domain joined and will also double as our file server. Hydrogen [192.168.34.254] - A Windows Server 2012 R2 Standard virtual server running on CARBON. 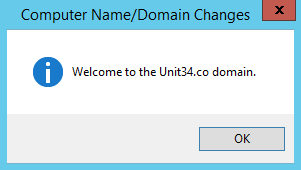 This virtual server is our domain controller and hosts the Unit34.co domain. It also has DHCP and DNS installed. The actual process of domain joining a computer to a domain is quite simple although it varies between different versions of Windows. In general, you open your system properties the same way like you would when you rename your computer. Instead of selecting a Workgroup, select Domain and enter your domain like the example below. You'll then be prompted to enter in the credentials of a domain administrator, someone who has rights in the domain to join computers to the domain. Once done, you'll get a confirmation that the computer is joined to the domain and that it needs to restart. 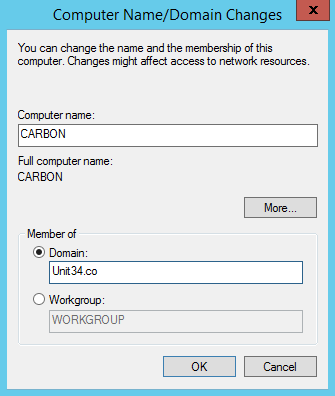 In our setup, CARBON is our Hyper-V host and we are domain joining it to our domain Unit34.co which is hosted on a virtual machine called Hydrogen hosted on CARBON. Can you see the interdependency here? Before performing the domain join, open the Hyper-V manager console on CARBON and go into the settings of the virtual machine Hydrogen. Make sure that the Automatic Start Action is set to Always start this virtual machine automatically and the Automatic Stop Action is set to Shut down the guest operating system. This will make sure the domain controller is available when CARBON starts and is shutdown gracefully when CARBON is shutdown or restarted. After performing a clean install of Windows Server 2012 R2 on a WD Sentinel DS6100, the LCD screen will not work and the system fan will spin at full speed. To fix this you need to install the Windows Server Essentials Experience role and the WD components. Do not do this until you have domain joined your server to your domain! 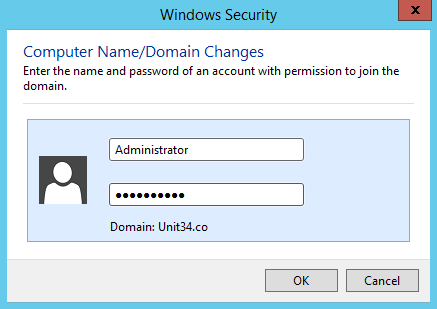 If you install the Windows Essentials Experience role before a domain join, it will automatically convert your server to a domain controller and create a new domain. This is not what we want. Perform the steps to install Windows Server Essentials Experience and the WD components when have domain joined CARBON to Unit34.co to fix your LCD and system fan issues.